Lucas Victor Beau was born in New York City in 1895. He served with the New York National Guard as a corporal on border patrol duty from June to December 1916. Appointed a flying cadet in August 1917, he entered the School of Military Aeronautics at Cornell University, and the following March he became an instructor at Eberts Field, Arkansas. A month later he entered gunnery school at Wilbur Wright Field, Ohio, and in June 1918 he was commissioned a temporary second lieutenant in the Air Service. Going to France that September he served at St. Maxient, and later that month entered the Pursuit School at Issoudon, becoming a ferry pilot with the Third Army Interceptor Command there in December 1918. 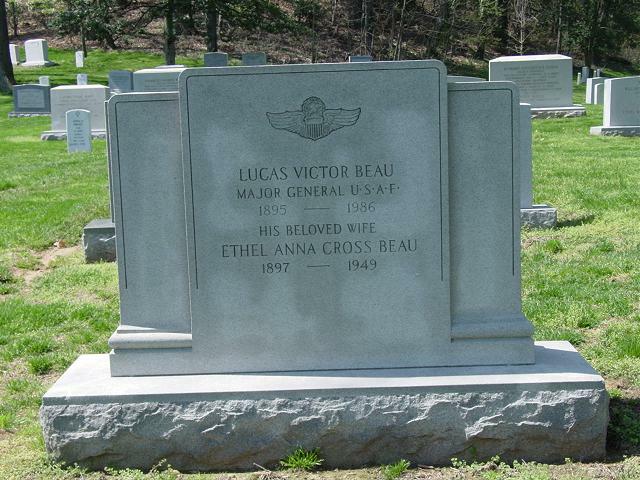 The following February General Beau was assigned at Mitchel Field, New York, served from March to November 1919 as recruiting officer and instructor at Hazelhurst Field, New York, and then returned to Mitchel Field. Commissioned a second lieutenant in the Air Service, Regular Army July l, 1920, he was immediately promoted to first lieutenant. Assigned at Langley Field, Va., from May to October 1921, he then returned to Mitchel Field for duty with the First Observation Squadron. A year later he joined the Air Service Headquarters Detachment at Bolling Field, Washington D.C., becoming engineer and supply officer of the 18th Headquarters Squadron there in July 1924, and assuming command of it a year later. Going to the Philippine Islands in November 1926, General Beau was engineer officer at Kindley Field, joining the Second Observation Squadron there in March 1927. He became an instructor for the Colorado National Guard at Denver in July 1928; entered the Air Corps Tactical School at Maxwell Field, Alabama, in August 1933, and graduated the following June. Joining the Fifth Composite Group at Luke Field, Hawaii, in October 1934 he assumed command of the 50th Observation Squadron there. General Headquarters there, becoming personnel and intelligence officer for the First Wing two months later, and executive officer in January 1940. That March General Beau was appointed assistant chief of the Personnel Division in the Office of the Chief of Air Corps, Washington, D.C., and four months later he was named chief of the Officers' Section, Personnel Division, becoming chief of the Personnel Division in July 1941. Assuming command of the San Bernardino Air Depot, California, in February 1942, he became chief of staff of the Air Service Command at Patterson Field, Ohio, in November 1943. Ordered to the Mediterranean Theater in March 1945, General Beau assumed command of the Mediterranean Air Transport Service in Italy, and the following September he was transferred to Wiesbaden, Germany, to organize transportation service for the European Theater. On October 1, 1947, Genera Beau was appointed national commander of the Civil Air Patrol at Bolling Air Force Base, Washington, D.C. He retired from active duty Aug. 31, 1955, and was recalled the following day in his former capacity. His decorations include the Legion of Merit. He is rated a command pilot, combat observer, aircraft observer and technical observer. He was promoted to captain April 4, 1933; to major (temporary) March 12, 1935; to major (permanent) Jan. 28, 1940; to lieutenant colonel (temporary) March 15, 1941; to colonel (temporary) Jan. 5, 1942; to lieutenant colonel (permanent) May 31, 1942; to brigadier general (temporary) April 27, 1943; to major general (temporary) Oct. 22, 1947; to colonel (permanent) April 2, 1948; to brigadier general (permanent) July 21, 1952. General Beau was buried with full military honors in Section 30 of Arlington National Cemetery.